If your birthday is before February 4, then your astrological sign is Dragon, not Snake. 2013 shouldn't be a great year for most of the Snake people. This is because there are too many taboos when Snake people are in the Snake Year. 2014 is Year of Horse. In Chinese Five Elements theory, Snake and Horse are in Fire group. They are same gang. They can get along well. That's a 2014 good news for Snake people. 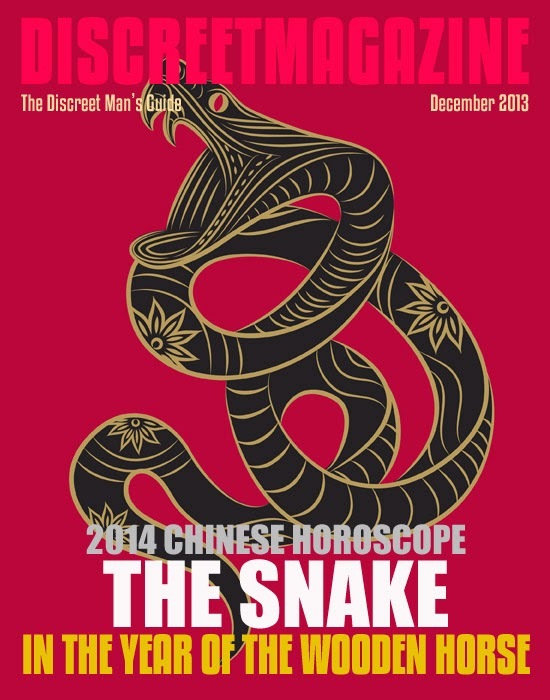 The lucky Salary Star, Intelligent Star and Romance Star come toward Snake people in 2014. The career luck, money luck and people relationship will be good. Year of Horse is the time to re-boot your life. Snake people need to learn from Horse, move faster and even fly higher to move up your level of life for yourself and family. Your hardship, discipline and cultivation from the previous year bring you good results this year. 2014 is Wooden Horse year. Wood is related to Snake's education and Intelligence. Snake people will become much smarter. Since your people relationship will be good, a career promotion is possible. Also, the Salary Star appears in 2014, your pay is not only stable, the salary raise will come. If you are in school, your academic achievement will have big improvement. If you want to attend an examination for career license or looking for a government job, then the Intelligent Star will help you to reach your goal. Snake people have slow income last year. In 2014, Snake people have very good career luck. The career position brings people the fixed and stable income. Snake people also have clear mind and creative idea in the year of Horse. They can start a new project or new investment to pursuit their wealth in 2014. Since Salary Star comes toward you, you can try on any job opportunity for better pay. In short, you must earn money from your wisdom. To gamble a risky investment without using brain is still danger. Male Snake people will do better investment and know how to earn money easier and quicker than Female Snake people in 2014. In Chinese horoscopes, Horse and Snake have attraction relationship because of Fire. Also, Horse brings a Romantic Star to Snake people in 2014. Therefore, the love relationship of Snake people must be great this year. If you are a single, it's time to join the social activities to find your companion. If you are in love, then your love relationship will be sweeter. You should think about a deeper relationship. If you are married, then you will have a wonderful marriage life in 2014. If you have double love relationships, then the Romantic Star could bring your trouble. There is a slight illness sign showing in 2014. That shouldn't create a big issue. As long as Snake people have good habit of enough sleep, right eating, proper exercise and good sanitation in your daily life, they will recover their health quickly when any small illness occurs. Senior Snake people might have to watch their health more often. Senior people should avoid to plan for a long-distance travel during the summer. 2014 is a Wooden Horse year. Horse is Fire and Wood helps Fire to burn longer. Snake is Fire, too. The Fire is too strong in 2014. It's possible that Snake people have too much Fire or too less Water in 2014. Too much Fire will cause problem in cardiovascular system. Too less Water will cause problem in urinary system. You have read this article2014 Chinese Horoscope with the title THE SNAKE IN THE YEAR OF THE WOODEN HORSE | CHINESE HOROSCOPE 2014 . You can bookmark this page URL https://thehalflifeoflinoleum.blogspot.com/2013/12/the-snake-in-year-of-wooden-horse.html. Thanks! Comments "THE SNAKE IN THE YEAR OF THE WOODEN HORSE | CHINESE HOROSCOPE 2014 "